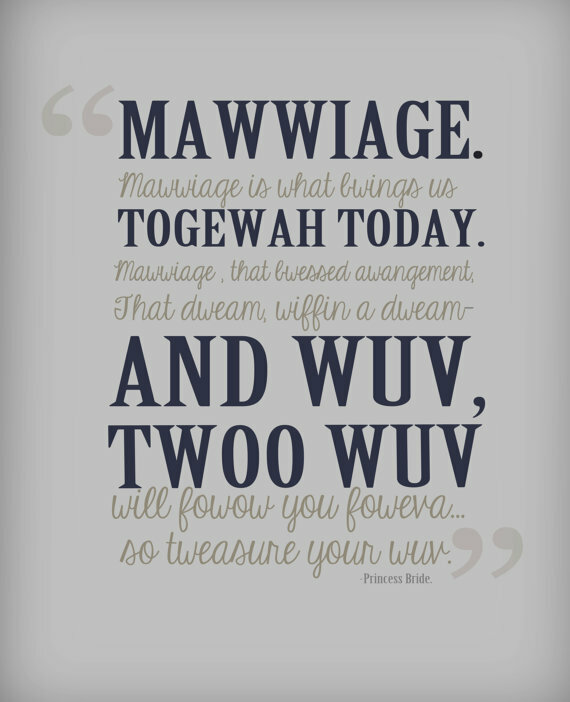 Warning: I cannot talk about love and marriage without referencing the Princess Bride. Inconceivable! See, it’s already happening. If you have not seen this movie, you simply must watch it. Right now. Seriously, go! And if you do not like this movie, I’m not sure if you can handle this post. Seriously, how can you not like this movie? Inconceivable! But I digress. We were talking about circles. Part One: Relationships are key to our life paths. Why? Because the purpose of life is love, and we actively pursue love through relationships. How do I know? Because God created us in His image, which is actually a Trinity of relationship (Father, Son, Holy Spirit). I like to think of relationships as circles. Part Two: The innermost circle is only me and God. I must get to know God through prayer, studying the Bible, and actively making Him central to everything I do. Part Three: I must know and love myself if I am to follow the two greatest commands (love God with all my heart, my soul, and my mind; love others as I love myself). I must free my essential self by facing vulnerability, making God-based decisions, and finding the courage to take risks through faith. Getting that innermost circle working has been essential to moving on to the next circle – my relationship with my spouse. Fixing this one can be very tough, but it is SO much easier now that I have fixed my relationship with Christ. If I had done that first, I would have saved myself and my husband so many frustrations. This relationship gets its own circle too, because it is THAT important. One flesh. One circle. No one else gets to be in this circle except me and my significant other. God is there too, because if I’m keeping focused on my innermost circle, He will radiate through every relationship circle in my life. But I have to remind myself daily that my kids do not get to trump this relationship. I will get to them next, but I have to remember how important it is to have the inner circles working in order to make every other circle successful. This is why flight attendants tell you that in an emergency situation you should put your air mask on first, before you help your children. The kids need me and my husband to be a strong, loving unit – a unit that is a Christian example to them for how a relationship should be. I can’t provide that lesson to them if I don’t put an air mask on my marriage first. 1. I can’t change him. Only God can change him – on His timetable, and only when he decides to change. I can only change myself and how I react. People tend to mirror each other. So changing my reactions and expectations may inspire him to change, or it may not. Changing my reactions and expectations usually means the problem was all mine in the first place, and he doesn’t actually need to change. 2. I shouldn’t expect him to fill every need in my life. Only Jesus is perfect. If I’m expecting my husband to be Jesus, I am bound for disappointment. And I can only pray he’s not expecting me to be Jesus for him. Because he will be sorely disappointed too. And it doesn’t mean we are incompatible if we aren’t in sync 24/7. He doesn’t force me to watch football, and I don’t force him to watch sappy movies. It’s best when we tap into our other circles to meet those needs, then listen to each other’s stories about it later. Find happiness within myself? That’s why the innermost circle matters so much. Because what is within myself leads to my joy. When I look within myself and find Jesus and the Holy Spirit, there isn’t room for anyone else to let me down. Do I still get disappointed sometimes? Sure. But it only stings a little instead of cutting to the core of my soul. And Jesus heals the sting quickly. 3. I must throw out the scorecard. It always causes problems. Striving to be Christ-like does wonders for my marriage, and for all of my relationships. Love, kindness, humility, sacrifice, forgiveness, and suffering – it doesn’t leave room for a scorecard. Is it fair that I’m cleaning the bathroom again? I don’t even know anymore because I try not to view it like that. I view these things as holy service, not as slavery to my husband. Jesus taught us to be servants. 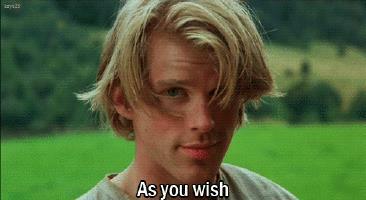 So did Westley. Changing my perspective and throwing out the scorecard leads to a mirror that often finds him by my side doing chores. Not because I nagged him into submission. Because love reflects love. Imitating Christ’s humility, letting go of the desire to be right, will quickly dispel most arguments. It’s not about being a doormat. It’s about being holy – a much worthier cause than being a doormat. I choose humility, not pride. I do it out of my love for God, not out of my own feelings or what I think I deserve. That’s when I see magic happen. 4. I must stop thinking everything is about me. Why am I so quick to assume that every comment, every heavy sigh, every sideways glance is about me? That it means I did something to provoke it, that he’s mad at me, that it means anything at all? And before I’ve even talked to him about it, why have I made up an entire story in my head and crafted comebacks and dragged the scorecard back out, ready for battle? Instead of instantly arming myself, I have to come at these situations from a different angle to stay in a place of love and humility. These phrases are my favorite way back to sanity. “Help me understand from your perspective.” Because when I don’t understand I jump to my own conclusions. 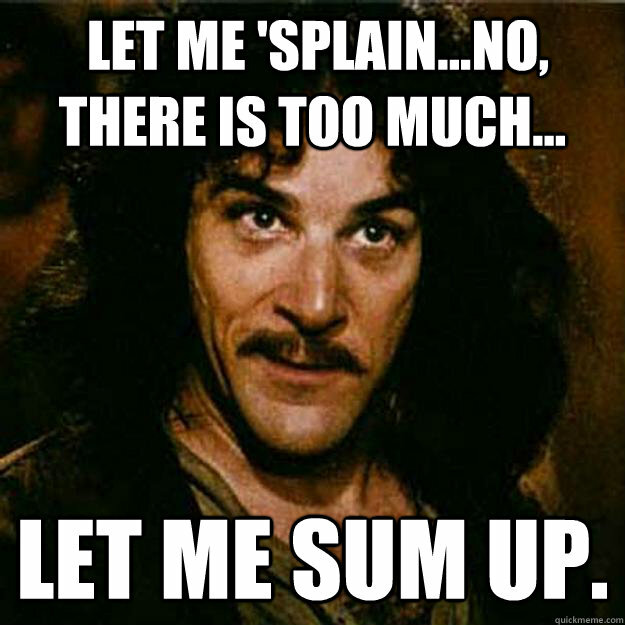 Giving him space to explain before I go off into a made up world can defuse an argument that never needed to happen. “The story I’ve made up is…” I learned this one from Brené Brown, and it gets used when I’ve missed the opportunity to let him explain. When I need to explain my crazy to him. This actually helps him understand how his action or inaction affects my brain, and gives him an opportunity to change his actions to avoid my crazy next time. Or not. But it’s way more fun than getting out the swords. 5. I must not play games. One of the best things I learned from Rob Bell is “this is really about that.” Life is short, and my marriage is worth effort. Effort to figure out what I’m really frustrated about before I bring it up. This is the person I chose to spend my life with, to raise kids with, to love for eternity – not some kid who is pulling my ponytail in 3rd grade. I can be mature enough to be completely honest and vulnerable with this most special person. So my frustration is not because he’s late, it’s because I feel worried when he didn’t call. It’s not because he didn’t put the dishes away, it’s because I feel overwhelmed. So let’s not waste time on this, let’s focus on that. 6. I must stop treating the one person I say I love the most on this planet like dirt. I get to the end of a long, stressful day. I can’t wait to get away from work to finally see my family. And the first thing I do? Spew all over them! I snap at my husband. Quick to anger. No patience. Why does this happen? I think it’s because I’m so comfortable with him. I feel safe, and I trust that he will love me no matter what. Plus, I’ve saved it up all day and he just happens to be standing in the way when I finally lose it. Not fair at all! The struggle is real on this one, but I’m trying. I often find humor to be the best weapon against this dragon. If you can’t tell already, I like to talk in movie quotes, and so does my husband. So a well-placed “As you wish” or “Inconceivable!” does us good, but I have to be careful! If I can’t say it without sarcasm, I have to keep it in my head!! I also think it’s necessary to make time for just the two of us. To continue dating. I’ve heard it a million times, but for good reason. I get dressed up. I try to impress him. I look at him with stars in my eyes. It matters, because we must communicate. And to communicate effectively about the most important marriage topics, we must actually like each other. 7. I must submit. Submission sounds scary, but I’ve learned it doesn’t have to mean “ownership”. Where I got in trouble on this one was with that beast that haunts me constantly – control. We live in a society that taught me no one gets to tell me what to do. I am woman, hear me roar! But I was taking that to the opposite extreme – planning out every second of our lives (which meant I was actually telling him what to do) and then complaining when I got overwhelmed with all of it. Submission is what frees me from trying to carry everything alone! Ephesians 5 is where people typically get all twisted up about this. But really read it. Because it doesn’t say women, be slaves to your husbands. It starts with telling all of us to follow God’s example and Jesus’ sacrifice. It says “Submit to one another out of reverence for Christ.” (Eph 5:21) There are roles for both of us, clearly lined out in the Bible. I submit to his authority, but his authority is determined by his love for me. I can’t expect my husband to do his role if I’m not doing mine. Every time I get stuck on thinking it’s not fair because he’s not doing his role, I go back to #1 above. I’ve got enough to do just focusing on my part. I’ll pray and let God work out the rest. When I do that, He always works it out. Always. 8. I must stay focused on Christ. As much as I love my husband, he cannot come before Christ and God’s mission for me. And I can’t get in the way of God’s mission for my husband. Not to neglect the marriage, but marriage can’t be healthy unless we seek His kingdom first. And it’s even more powerful when we are working together toward God’s mission. There is so much that can be done in this circle. It’s overwhelming just to know where to start. When that happens, I like to start with a vision and then set up action items to tackle a little bit at a time. I know it sounds business-like, but marriage is one of the most important businesses to be involved in. So it’s important to me to have a vision for our marriage. To talk about what God is calling us to do. To figure out what sacrifices it will require of each of us to fulfill God’s mission. To check in on that vision regularly to make sure we’re still headed in the right direction and ask if anything needs to change (hint: do not ruin “date night” with a business-type meeting). To be fascinated at how each of our strengths fit together to create something that couldn’t be done alone. And when all of that seems impossible, start with a kiss. Even if you don’t have a sunset and a white horse, make it count. This post is dedicated to my husband. The love of my life. The one who has patiently lived through my crazy for over 16 years while I have figured out who I am and how to be a good wife to him. The father of our two amazing kids. There is no one else I would rather be mad at. There is no one else I would rather laugh with. There is no one else I would rather share this journey with. There is no one else I would rather quote the Princess Bride with. “To blathe!” I love you, John. For eternity.